The Bentley Continental Supersports Convertible is one of the world’s fastest four seat convertibles, with superlative elegance and a price tag to match. The standard Bentley Continental GTC isn’t exactly a shrinking violet, but the Supersports is even more striking. The additional bodystyling is form following function, but there’s a mechanical beauty about it all, with vents feeding an additional 10 per cent of air to the engine and brakes, and subtly flared wheelarches house the wheels which are further apart for improved handling. Larger exhaust hint at the improved performance and all chrome has a smoked finished to set the car apart further. 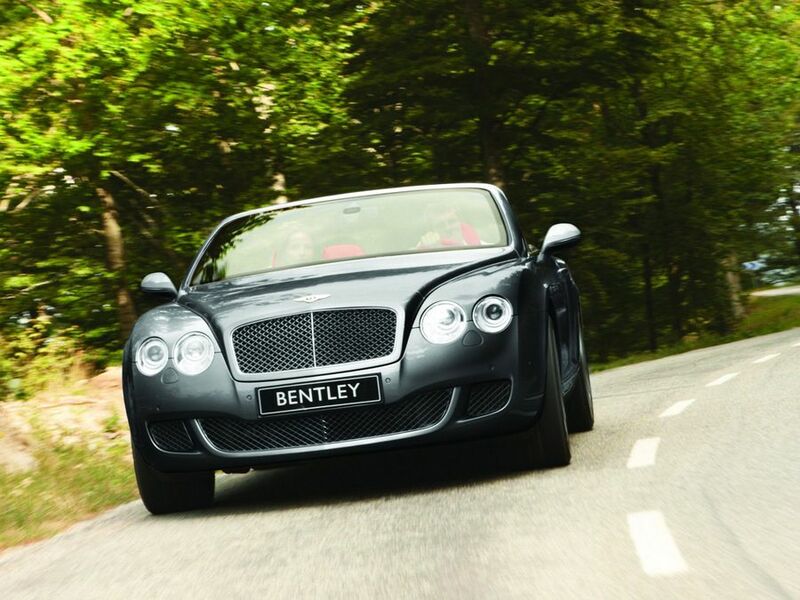 Bentleys almost always provide a sense of occasion, but the Supersports Convertible even more so. But aside from the extensive but judicious use of carbon fibre, there’s little to suggest the car costs around £50,000 more than the standard Continental GTC. Lightweight carbon fibre front seats covered with quilted alcantara are comfortable and the dials and instrumentation are elegant, save for the sat-nav which has a dated-looking screen. The steering wheel and gear lever are trimmed in soft touch leather, and drilled alloy pedals evoke images of race cars from the 1930s. Roof up, the Continental Supersports works as a grand tourer with 370 litres of room accessed via an electrically-operated bootlid. Roof down space reduces to 235 litres, which is just enough to squeeze in luggage for a weekend away. The carbon fibre sports seats are comfortable and supportive. The biggest bar to practicality is the car’s size – it fills an average-sized parking space and can be tricky to weave along twisting country lanes at speed. Bentley’s engineers have managed to shed almost 100kg from the standard car, but the Continental Supersports Convertible still tips the scales at nearly 2.3 tonnes. Despite this, the car is surprisingly agile – particularly with the adjustable suspension in its sportiest setting – but drivers looking for a Porsche 911 GT3 RS-style stripped-out racer will be disappointed. The steering remains luxury-car light, but is direct and fast and can make a trip to the shops as entertaining as a blast through Monte Carlo. The steering is firmer than the standard car, still soaking up bumps, but significantly reducing body roll. As before, it is four-wheel drive and provides enormous grip. With a six-litre, W12 engine with two turbochargers, the Supersports Convertible’s performance is epic. It’ll reach 62mph in 3.9 seconds and achieve a 202mph maximum, which makes it one of the world’s fastest four-seat convertibles. Acceleration is relentless, and the car feels as though it has almost limitless power, pressing the occupants as hard into the seats between rest to 40mph as it does from 60 to 70mph. Power is transmitted to all four wheels via a seven-speed automatic gearbox, which has a sport setting as well as a pair of paddles behind the steering wheel. With a purchase price of more than £178,000, and an options list which can push the price in excess of £200,000, the Supersports Convertible represents a considerable investment. Bentley quotes an official average fuel consumption figure of 16.9mpg, but our figures were nearer 12mpg. CO2 emissions of 388g/km means road tax costs are considerable, as are insurance premiums, but these figures are comparable with other cars of this type. The Supersports can run on any mix of petrol and bioethanol which reduces its environmental impact, if not its road tax rating. Under Volkswagen’s ownership, Bentley’s reliability record has been impressive. It shares a significant amount of components with the Volkswagen Phaeton which gives mass-market confidence. The sheer size of the Continental Supersports means the driver and passengers feel very safe and the brakes are the largest fitted to any production car. Four wheel drive gives huge amounts of grip, while active safety equipment includes an advanced electronic stability programme, eight airbags and traction control. The price premium over the standard Continental GTC convertible is mainly justified by the car’s go-faster equipment such as carbon-ceramic brakes, 20-inch alloys and carbon fibre seats – all used to save weight. Other kit includes leather and alcantara upholstery, fully-electric retracting roof, an automatically opening and closing tailgate, sat-nav, Bluetooth and a Breitling clock. It’s impossible for four to go faster in a drop top in as much style.